Luis Felipe Noé is one of the giants of contemporary Latin American art. He is a protean conceptual innovator, whose art has never ceased to change: today at the age of 83, he is making some of the most powerful works of his long career. 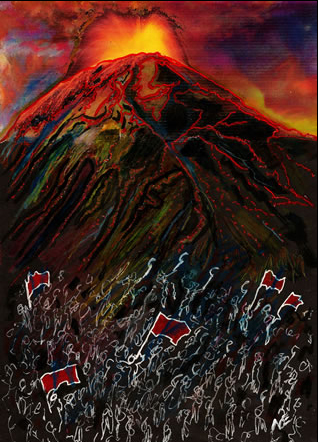 El estricto orden de las cosas (2006), mixed media on paper. All images courtesy of Luis Felipe Noé. Noé first gained fame in 1962, when he organized a group that united four young painters - Ernesto Deira, Romulo Maccio, Jorge de la Vega, and himself - into what became known as Nueva Figuracion (New Figuration). 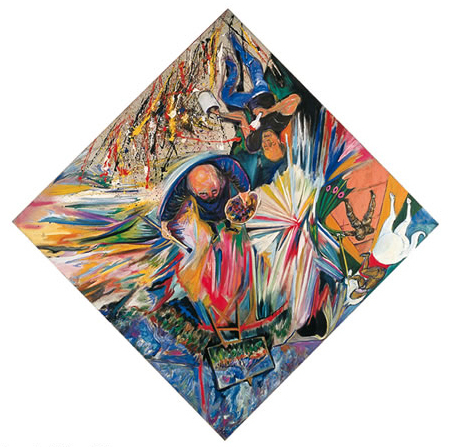 These four talented painters together had an explosive impact on Argentine art, working on the border between gestural abstraction and figuration. Their work was distinct from that of their peers elsewhere, but there were parallels between their art and that of Karel Appel in Europe and Willem de Kooning in the US. 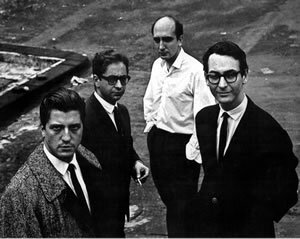 Always restless, in 1964 Noé began the first of what would become numerous extended stays outside Argentina. 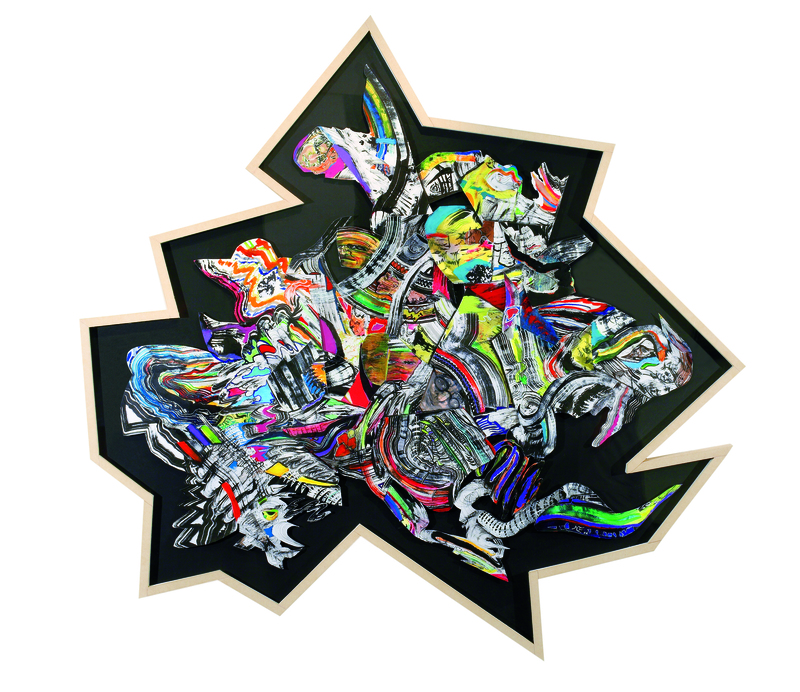 In New York, he began to work in three dimensions, building from a base of oil on canvas by adding metal and wood elements, often at acute angles to the canvas. Although these works were related to Rauschenberg's combine-paintings, they differed from them in that Noé did not add found objects to his paintings, but instead sculpted the collage elements to reinforce and complement the two-dimensional painted forms on the canvases. These three-dimensional works effectively created a new genre, though this has generally been overlooked, in part because Noé, consistently concerned less with form than subject, did not bother naming his innovation. ¿A donde vamos? 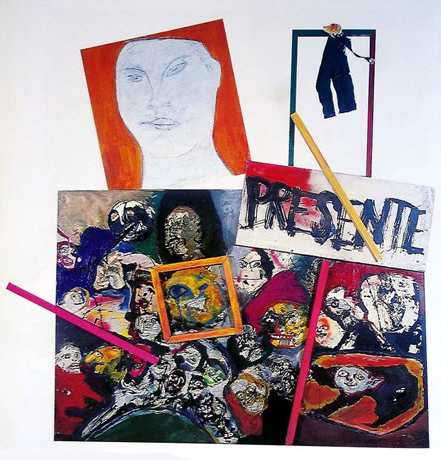 o Presente (1964). Noé's career has taken many unexpected turnings. In 1966, an artistic crisis led him to give up painting. He opened a bar, Bárbaro, that soon became a meeting place for Argentine artists and intellectuals, and was quickly decorated with murals and paintings. Noé published a novel, and several texts of theoretical writings that considered the role of art in relation to modern technology and politics. 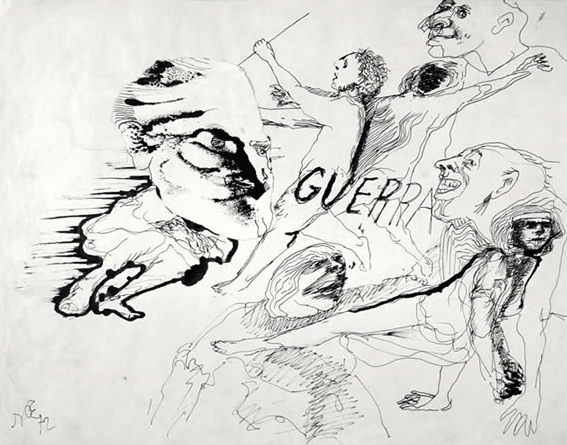 Like Pollock, Noé began making drawings for his psychoanalysis, and in the mid-'70s this drew him back to painting. Noé loves Argentina, art, and Argentine artists ("and life," he added, when I asked his opinion of this statement). And Argentine artists clearly reciprocate his love. To see Noé in a group of artists and critics is to see deep affection, that speaks eloquently of Noé's warm personality. He is among the most generous of artists: for decades, he has been a teacher and mentor to dozens of aspiring Argentine artists, and in 2006 he and Eduardo Stupia founded La Linea Piensa - The Line Thinks - which has provided a showcase for more than 50 young artists in Buenos Aires' Borges Cultural Center. Noé has received countless awards and prizes. Among scores of exhibitions at galleries and museums, he has been honored with retrospective exhibitions at Argentina's National Museum of Fine Arts, Mexico's National Palace of Fine Arts, and Brazil's Museum of Modern Art; the Argentine National Museum has also honored the New Figuration with an exhibition. El uso del derecho a voto (ca. 2010). Noé is a conceptual innovator, whose art expresses his love for Argentina and its people, and his anger at the governments that have harmed them. He has made a series of innovations in form, but he does not consider these important, for to him form is merely a means to his real goal: in conversations about his work, he gently but consistently deflects attention from his technique to the meanings of his paintings. In recent decades, Noé's art has ranged over a series of subjects, including notably the natural landscape of South America, and the history of its countries. His art has never ceased to change, following his belief that "chaos is not disorder but the actual order of things in a permanent state of mobility." His recent paintings are often very large, they are often cut into irregular shapes, and individual works are often made up of multiple pieces. The style of painting varies not only across works, but within individual works. But there are nonetheless consistencies that unite Noé's works. Prominent among these are bright and vivid colors, vigorous brushstrokes, and powerful forms. And above all, in spite of their diversity in many dimensions, the works all share a visual resolution that comes from Noé's strong and unfailing visual sensibility. 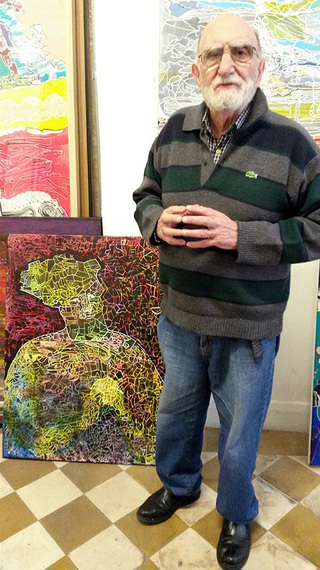 Luis Felipe Noé in his studio, 2016. Noé today continues to work tirelessly in his Buenos Aires studio, producing paintings and sculptures not only for his annual exhibition this November at Buenos Aires' renowned Rubbers Gallery, but also for a major exhibition of his work in 2017 at Argentina's National Museum of Fine Arts. It is abundantly clear that his work will never lose its excitement and dynamism, and that Noé will never cease to make beauty from chaos.